While some productions use flashy animatronics to bring creatures to life, Glasgow-based theatre company Modest Predicament stays true to its name and takes a far more home-spun approach. In this gentle tale of a baby dragon dropped into the ocean and raised by whales, everyday household objects take on a whole new purpose. A simple lampshade and tumble dryer vent hose becomes a dragon, a table tennis bat is transformed into a ray fish bobbing under the water, a small paper lantern is opened and closed to depict a puffed-up blowfish. Each clever invention not only raises a smile, but lets the young audience watching know how easy it is to be imaginative at home. 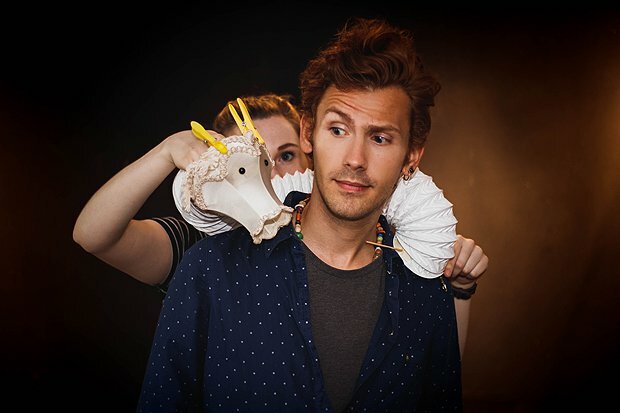 The story itself feels drawn out, leading at times to a lack of pace – and there's less here to warm the heart than in Modest Predicament's 2016 Fringe outing, Erin, Errol and the Earth Creatures. But with shadow puppetry, songs, audience engagement and plenty of energy from the two cast members, there's enough here to make for a pleasant hour. Assembly Roxy, until 27 Aug (not 13, 20), 12pm, £9 (£7). The tale of a dragon that grows up among whales.